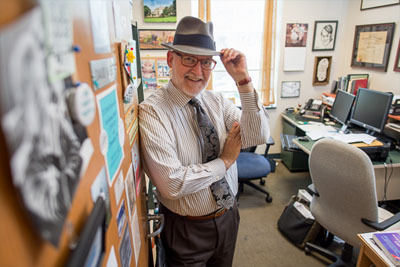 Associate professor of communication studies David Weber believes emotional and spiritual connections breed intellectual curiosity. Those connections, he says, bridge classrooms and workforces and stimulate intellectual growth by making theory real. NEW: Join Thousands of Seahawk Fans at UNCW Homecoming Feb. 3-5! 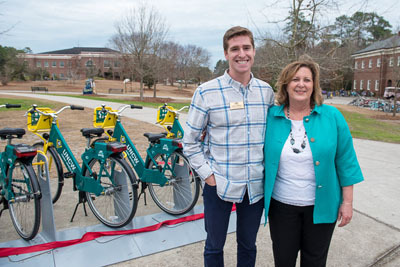 NEW: MySeaport Temporarily Inaccessible Jan. 25 from 1 to 4 a.m.
Nick Cannon, transportation coordinator, and Sharon Boyd, associate vice chancellor for business services, are pictured at the Hawk Wheels Bike Share information session and ribbon-cutting ceremony on Jan. 18 at the Campus Amphitheatre.